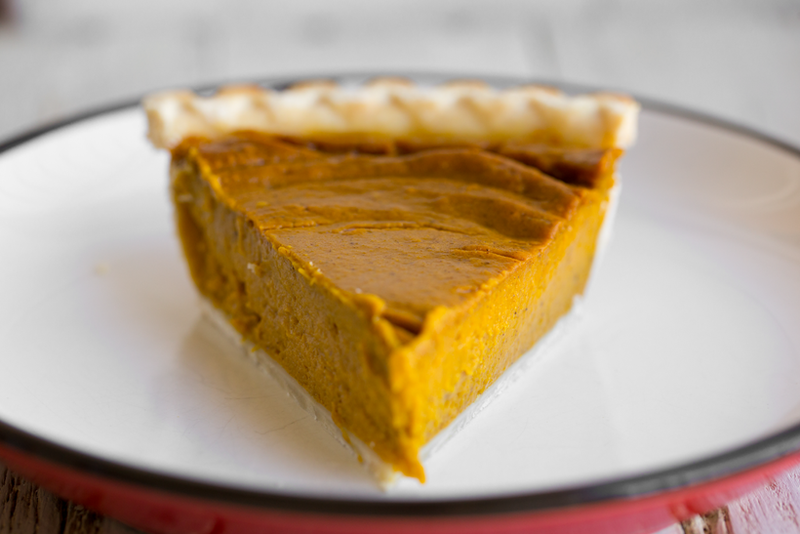 Today I share a holiday favorite, Vegan Pumpkin Pie. This one with two recipe options (cheesecake-infused or traditional) and you can totally pull this off in just about five ingredients. Easy, delicious and classic for the holiday season! Pumpkin Pie was always my favorite part of the holiday season. We would eat leftovers for breakfast and lunch and I would get so excited to be eating dessert for breakfast with my mom's permission. Heck, she was diving in too! I mean, we usually didn't do the whipped cream on top and then yeah, totally breakfast-worthy fare. Add the whip and it becomes dessert. 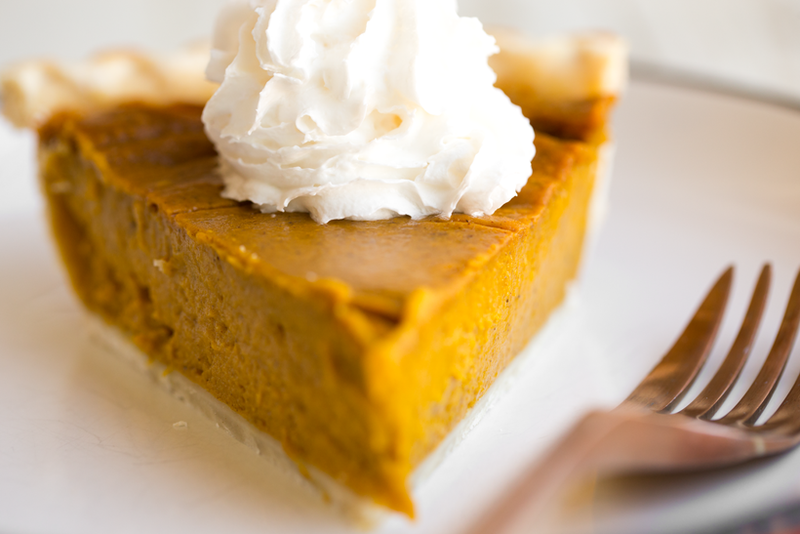 Pumpkin Pie is like the little black dress of desserts. You can dress it up or dress it down. Vegetable pie daywear and decadent spiced dessert, creamy things on top for the twilight hours. Ok, but really, pumpkin pie is just a staple for most people during the holidays. And usually recipes call for eggs and condensed milk - very non-vegan things. 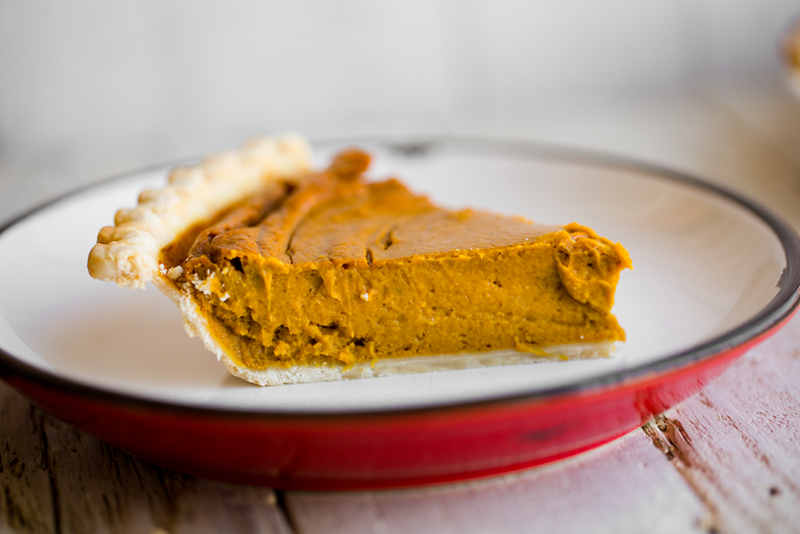 So for everyone looking to veganize their pie - or just hoping to make it a bit healthier - this post will give you the tools and tips you need! Hope you love these pies and make them year after year like we certainly do!.. Make the holidays easy! 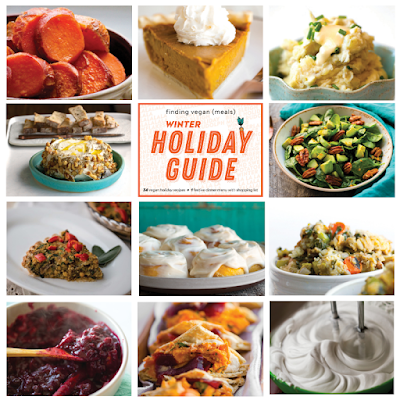 Snag my 40-page Holiday Meals Guide! Get it over on Finding Vegan Meals! Watch me make some pies!.. I absolutely play around with the crust when I am recipe testing. 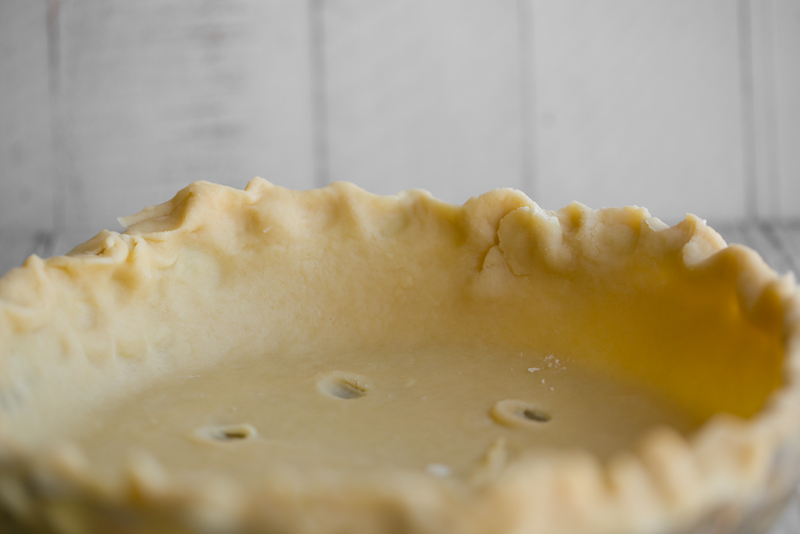 Sometimes I just really love the look of a perfectly crimped pie edge with the ease of store-bought. And other times I want an imperfect homemade crust. (Both ways work!) I think everyone should attempt a homemade crust at least once (it is pretty fun + easy if you don't mind the baking mess). But I also want you guys to know that buying a frozen crust is totally fine too. There is a vegan-friendly brand called Wholly Wholesome. What are the differences? 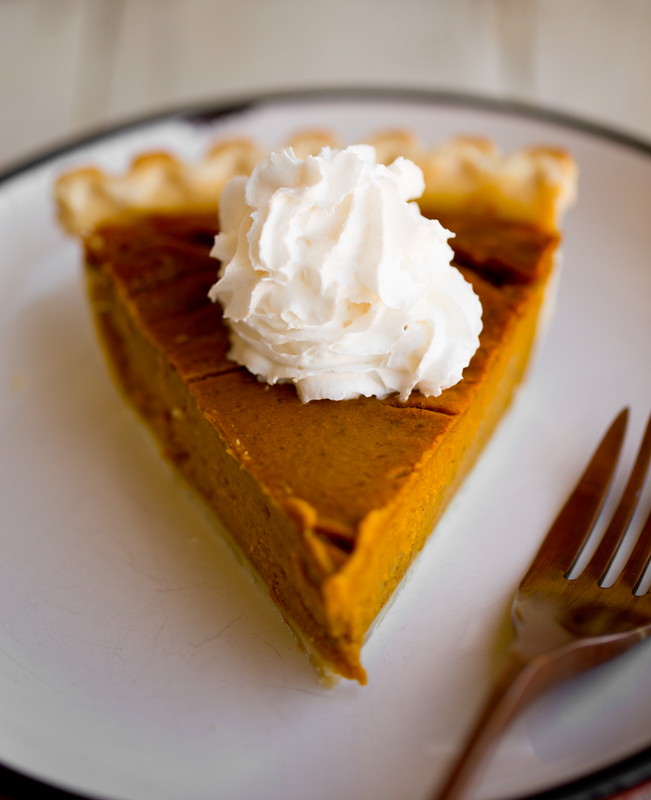 The basic pumpkin pie has more moisture and is a bit fluffier. The cheesecake pumpkin pie is a bit more dense and dry in a good cheesecake-y sort of way. A bit richer in texture. 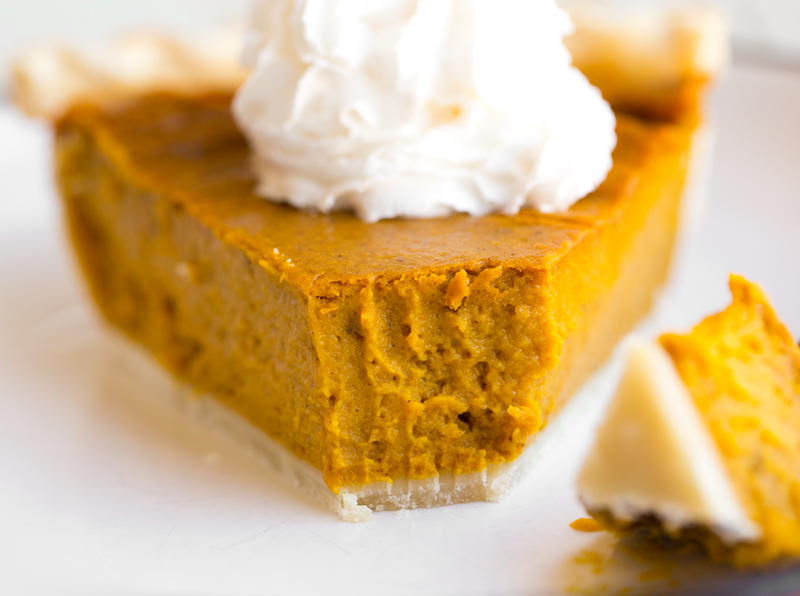 The flavor of the basic pumpkin pie is sweet and spiced, lovely and traditional. The cheesecake version adds a tart and tangy cream cheese undertone. mellowing out the spice a bit. Which version do I like better? Tough call!! I love the moist and fluffy texture of the basic recipe. And note, I recently started adding the one apple to the pie mixture and really love what that does! 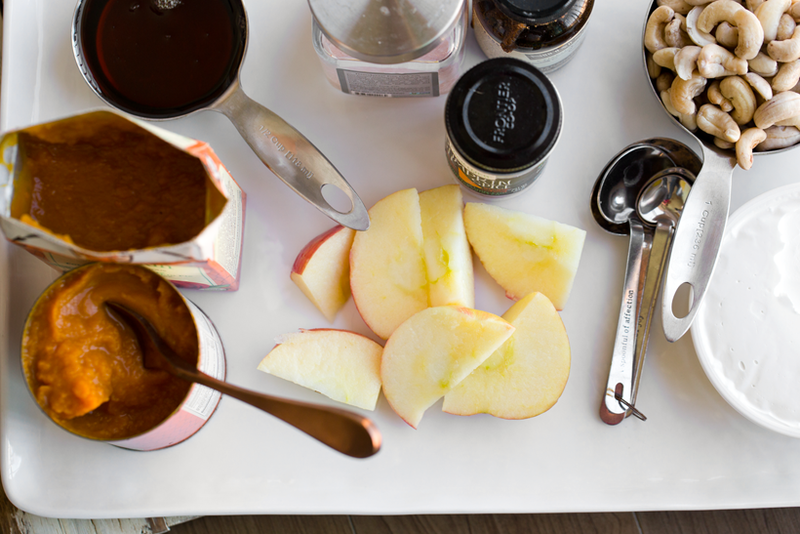 The apple is optional but give it a try I think it adds a bit of fiber and some apple cider sweetness! I adore this pie with a swirl of soy or coconut whip on top. But I will say that for a more dessert-y, rich textured cheesecake-meets-pie, I love the cheesecake version! 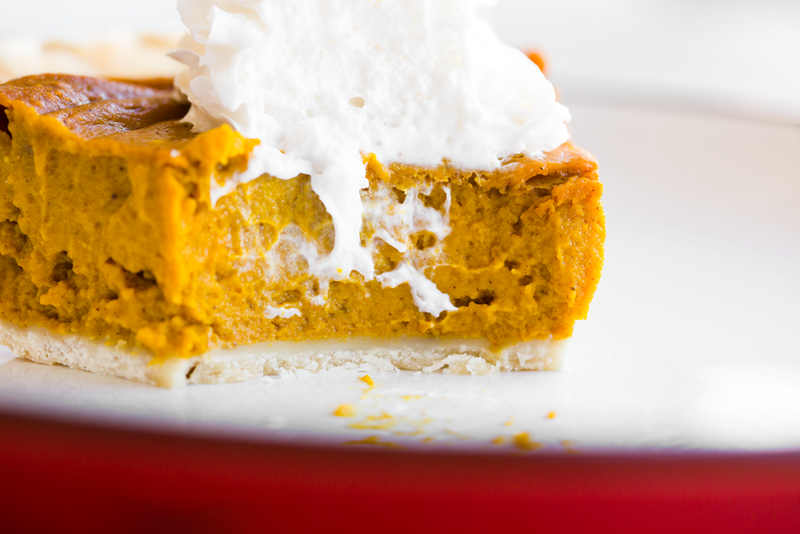 I really like the combo of cream cheese and pumpkin pie, baked into a dense and rich dessert. But actually, it is still really healthy, rich in ingredients like pumpkin, cashews, optional apple, spices and more. This was the cheesecake version all blended and lovely. That orange color..
Today's DIY crust. Made this one quickly, wasn't in a 'looks perfect!' crust mood lol. Tasted amazing! Whip on top! 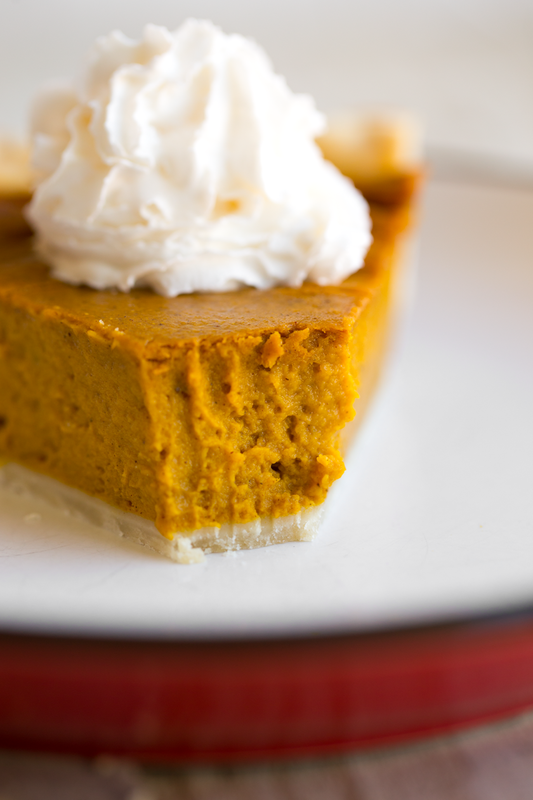 Or a la mode... the best part about pumpkin pie or cheesecake pie is the topping! I love using an easy store-bought soy or rice whip (from the brand Soyatoo). But my favorite topping is homemade coconut whip. Get my coconut whip recipe + video here. 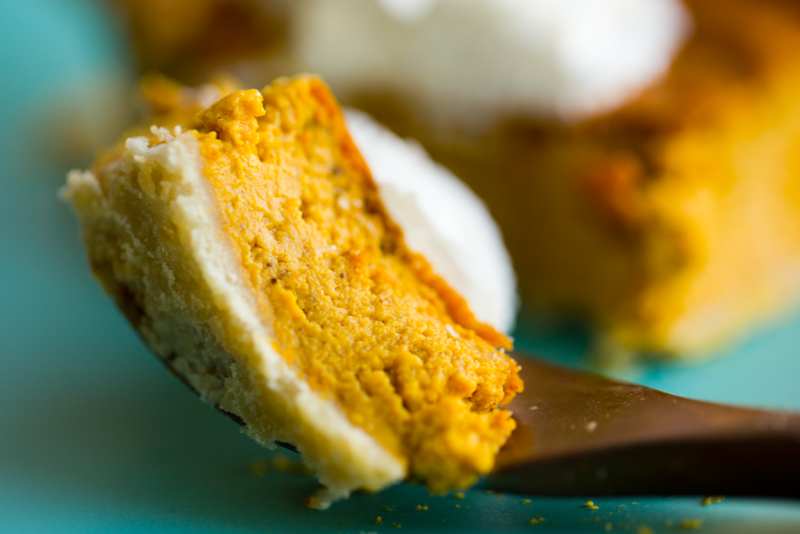 Ice cream is another side dish that pairs so well with pumpkin pie. 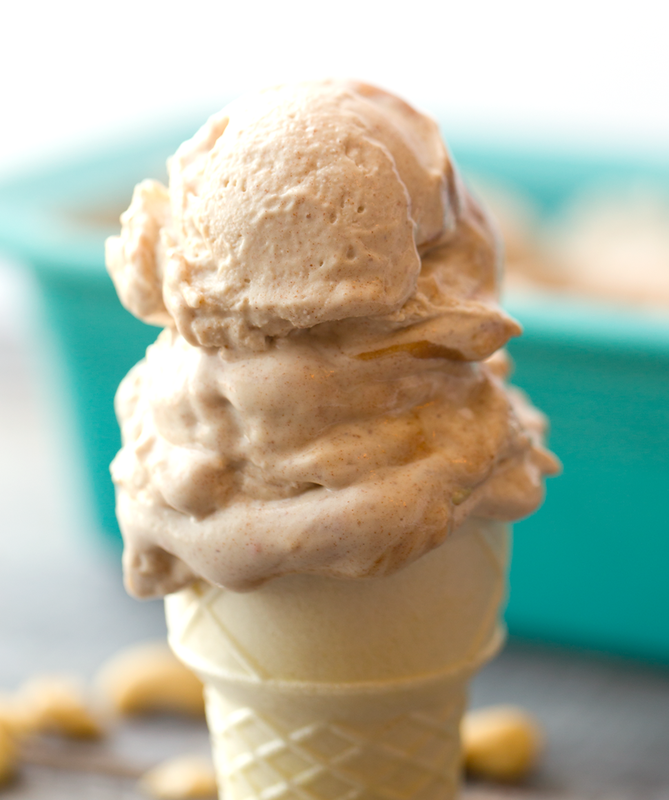 I would use my Salted Caramel Ice Cream! It is cashew-based so pairs so well with this recipe. Serve this pie warm or chilled. For warming, I usually pop individual slices in the microwave for 10-20 seconds. If the pie is very chilled, 30-60 seconds might be needed. If you don't want to use the microwave, you can take your chilled pie and pop it in a 300 degree oven for around ten minutes. This will produce a subtly warmth. I personally love chilled pit, but those are a few options if you (or your guests) prefer it served warm. What's with the apple? I recently started experimenting with tossing one small, sweet apple (usually a Fuji or Honeycrisp or similar) right into the blended filling mixture. I really like this! It kinda acts as an egg replacer since apple has fiber and pectin. It also adds a lovely bonus hint of fall-infused sweetness. The apple was not part of my original recipes, so you can totally omit if desired. But I love that the holiday season gives us the opportunity to try new spins on our old faves that we make year after year! It can be fun to try tiny twists and tweaks. This is one small tweak that I am calling a keeper! But some recipes do not need messing with, ha. 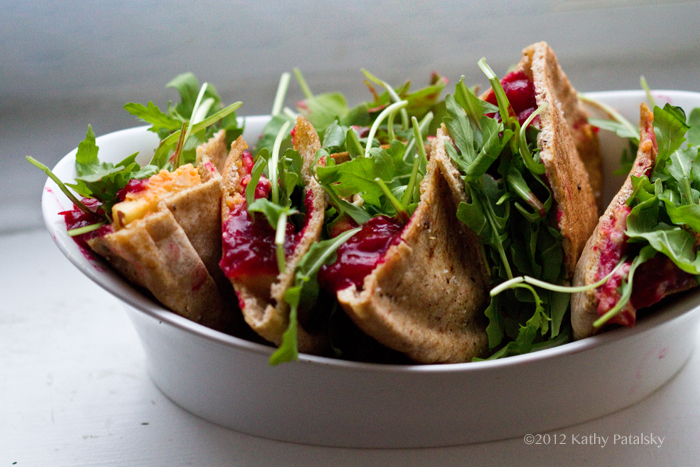 Like that one year I didn't plan ahead and was forced to use pita bread to make my stuffing. Haha. It totally tasted amazing! But I probably wouldn't do that again. Fun to improvise though. But I Just Want a Healthier Pie... Cool, me too! I personally do indulge in a homemade flour crust with this pie for the holidays, butter and white flour and all. But a few healthier options could be to try a crustless pie. A graham or gingersnap cookie crust. Or get creative with an oat-nut crust. I mean, truly, the crust is usually the most unhealthy part of a pumpkin pie. (Or the whip, if you tend to swirl it on really tall like I do.) Or if you add a giant scoop of ice cream. Well just remember that if you just want a healthier pie for whatever reason, lighten up the crust in some way and go easy on the toppings. The filling is good to go if you use my recipes below. - I want an extra moist pie filling... bake on the short end of the baking time. You could even reduce the heat a bit to prevent browning on top. Another option is to add that apple and even use a bit larger sized apple. The apple really moistens up the classic pie. And I would NOT do the baked cream cheese-infused version if you want a fluffy moist pie. You can also play around with a no-bake recipe for a very moist filling. 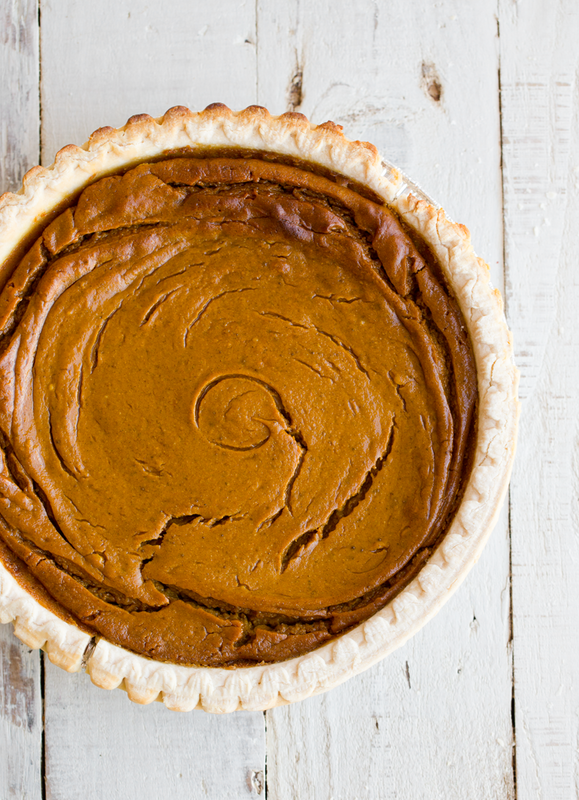 Like this walnut pumpkin pie. - I like a brown bubbly top! How do I do that?.. Bake on the long end of the cooking times, 55 minutes should do it. If you have a convection bake setting on your oven, use that because it will circulate more air and really bake things more quickly and therefore start the bubbling and browning part more swiftly. If you hate browning, see above and reduce the heat a bit and/or bake a bit less. 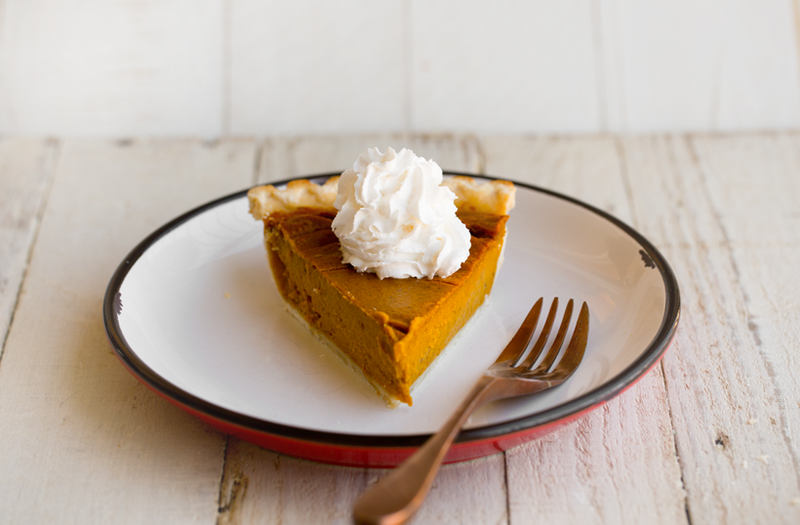 Remember, slow and long is the best way to bake a pumpkin pie. - Wait, but what temp do I bake a pumpkin pie at? The gold standard across many recipes is 425 for 15 minutes, then reduce heat to 350 for an additional 40-50 minutes. I like my pies bakes nice and through, and since cashews are not eggs, and do not 'set' as quickly, I usually do a good 50 minutes at 350. A big consideration is if you what size pie dish you are using or if you fill your pie extra thick or a bit on the thin side. Sometimes I use two different sized pie pans and that can need some tweaking. If you have questions, leave a comment and I will try to help! - Do a practice pie! Do not wait until the day before Thanksgiving to make your first ever pie. Every baking recipe has a learning curve dependent on your own oven, your specific brand ingredients you use, how you prep the cashews and more. It is a smart idea to do a test pie, like now! If you want, just use a pre-made pie crust for your tests to make things super simple. Unless you need practice with a DIY crust. I have a great video for a homemade crust here - it is an OLD video but still works well! - Pumpkin brands vary in texture... The canned pumpkin is usually drier than the boxed (Tetrapak) pumpkin. I like to use the cans better for the texture, but both work. Sometimes a combo of one of each works well. If you have time and desire to, you can even make your own pumpkin puree from scratch like I did for this recipe. - What else? Feel free to ask questions in the comments. If you like this, you might also like these recipes + links!.. 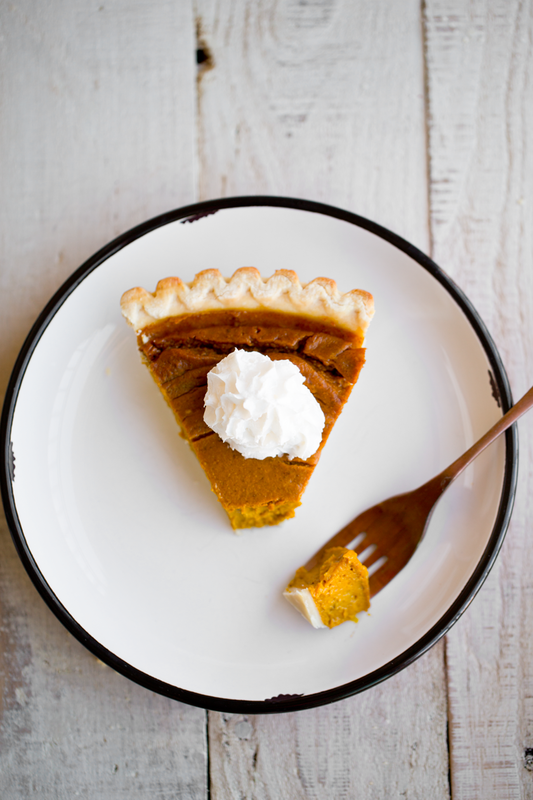 - 4-Ingredient Vegan Pumpkin Pie - for you minimalists out there. - Swirled cheesecake pumpkin pie! 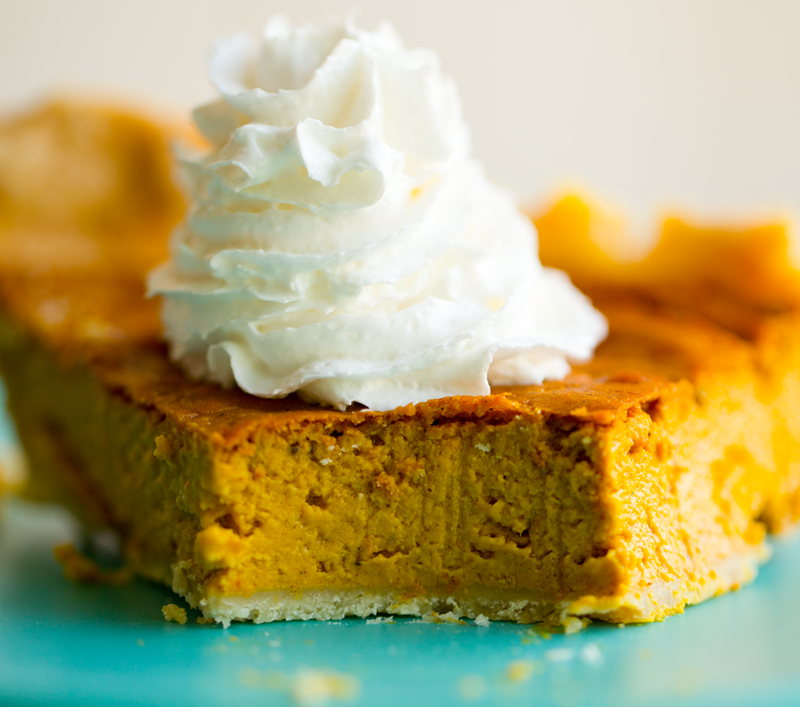 This is a fun way to add a 'cheesecake flair' to your pumpkin pie. You could easily work from this recipe method to make today's recipe - with a few improvised tweaks. 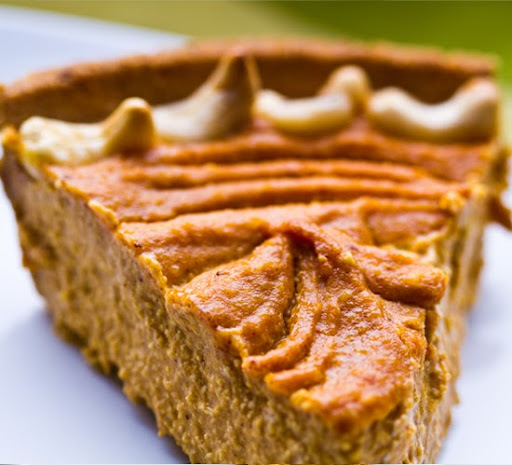 - Maple Bliss Pumpkin Pie, this recipe is similar to today's recipe, only it doesn't add any apple and also the recipe is for just one pie. A few other minor differences too. - Vegan Baked Cheesecake, something to swirl into your pie if you feel compelled! Graham cracker crust recipe here too. - Vegan Peach Pie with DIY crust. One of my very first videos I made a loooooong time ago, ha! But the recipe + video are still pretty helpful for a vegan pie crust. - Dark Chocolate Mousse Pie - I really need to re-shoot the photos for this recipe because it is an old recipe, one of my faves and I want to do a video too! 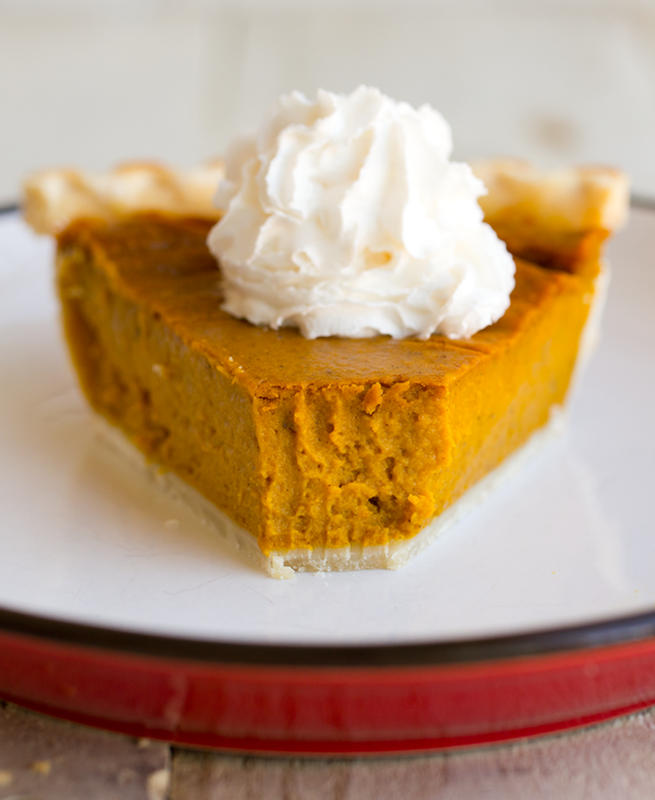 - Hubbard Pumpkin Pie - this was really fun to make from scratch using the traditional 'pie pumpkin,' hubbard squash! Tasty too!! - Vegan Caramel Apple Pie - another seasonal fave for good reason! This is the best comfort food dessert around the holidays! 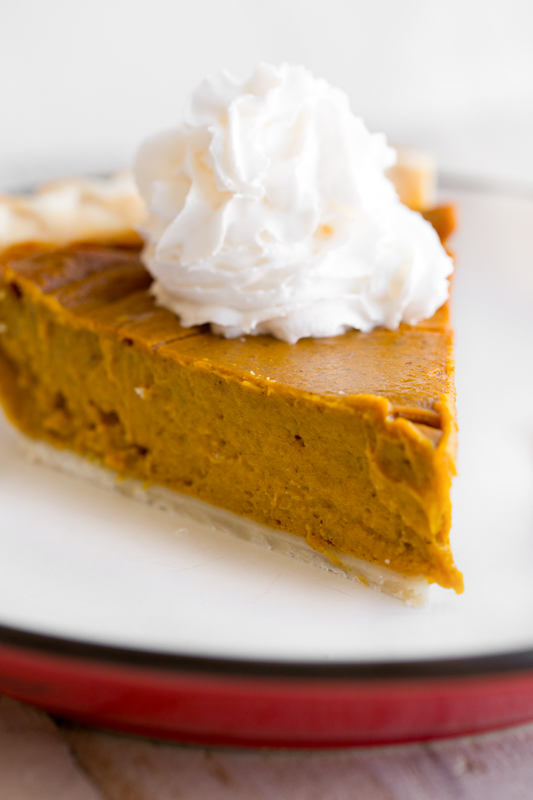 And vegan pumpkin pie can be so easy to make. This pie uses raw cashews and a few other optional ingredients to enhance the flavor and texture. Various crust options include flour, graham or cookies - DIY your crust or buy them from the store for additional ease. Version Notes + Tips: Before you get started, consider which version you want to make. 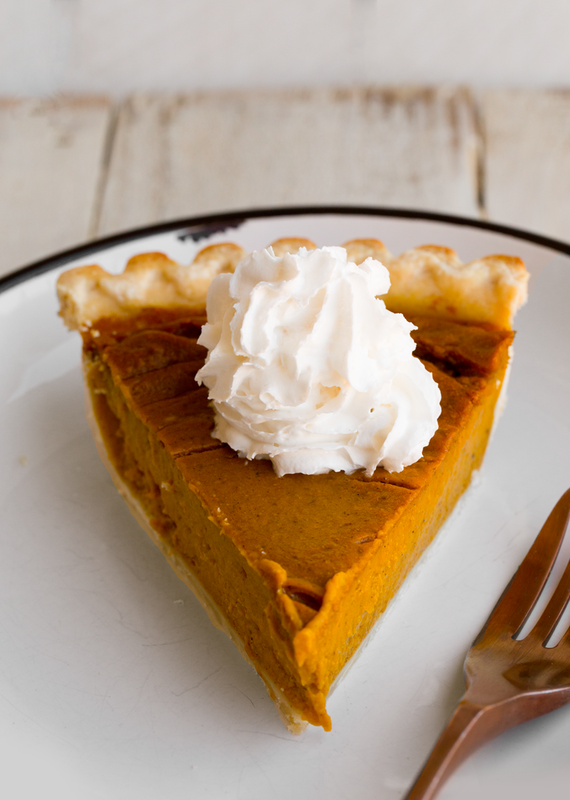 Traditional Version: If making the traditional pie, add all the main ingredients (pumpkin, maple, salt, spice, cashews) then consider if you want to add in a small apple and or some fresh vanilla bean or vanilla extract. I advise adding in the apple because I think it fluffs up the texture a bit more. Cheesecake Version: If making cheesecake version, add in all the 'basic' pie ingredients (apple + vanilla also optional, but advised, here) and simply add in the additional cream cheese. Thickness: I have actually found that since the basic pumpkin pie fluffs up a bit more than the cheesecake, the thickness of the pies comes out pretty even - even though the cheesecake version technically has eight more ounces of ingredients mixed in. More questions? Fell free to leave a comment below and I can help! Alrighty, let's go! Prep your crust. If you are making a crust from scratch, follow directions according to recipe. IF using a frozen crust from the store, you may need to pre-bake it a bit. Follow package instructions. Pre-heat oven to 425 degrees for pie baking. 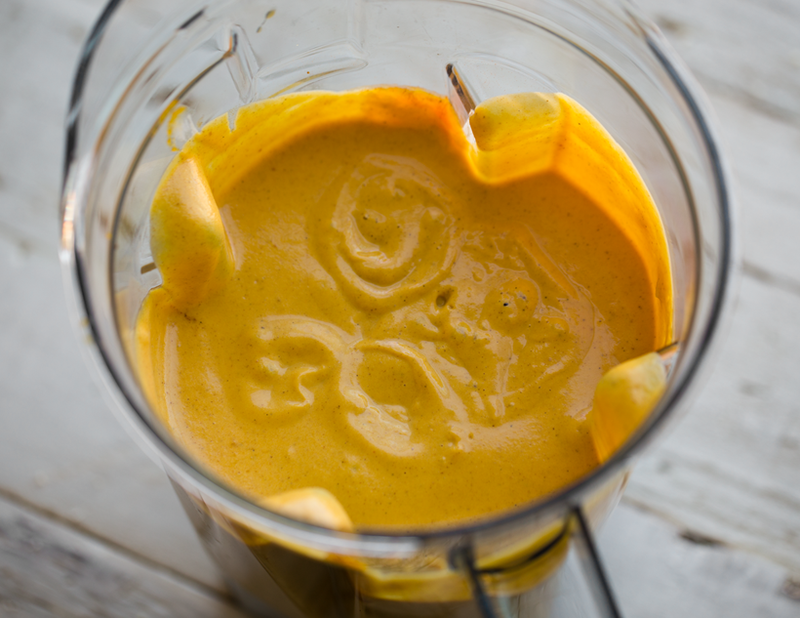 Add the pumpkin puree, maple syrup, soaked and drained cashews, pumpkin pie spice and salt to a blender. If adding optional ingredients, do that now as well: apple, vegan cream cheese, vanilla. Pour the pie filling into your two pie crusts. Bake at 425 degrees for 15 minutes. Then reduce oven temperature to 325 and bake for an additional 40-50 minutes. You want the top to be slightly browned and bubbly. Longer baking time will lead to a drier filling. I personally like my filling a bit more 'over-baked' than 'under-baked,' but that is up to you. Cool pie on the counter for an hour or so, then cover with foil and chill overnight in the fridge for serving the next day. Pies can be made up to 4-5 days in advance and stored in the fridge. Cook time: 00 hrs. 55 mins. Facebook teaser video on FindingVegan..
Last year, one of my favorite recipes from the fall/winter holiday season was my recipe for Vegan Swirled Pumpkin Cheesecake. Creamy layers of pure pumpkin swirled with cashew-blended tofu cream cheese. Vanilla, maple and cinnamon spice. The pie was a hit with everyone at my Vegan Thanksgiving feast (even non-vegan children and their skeptical parents were ogling at a second slice). *NEW BONUS: 3-Ingredient Pie! see below..
Three Ingredient Pie. 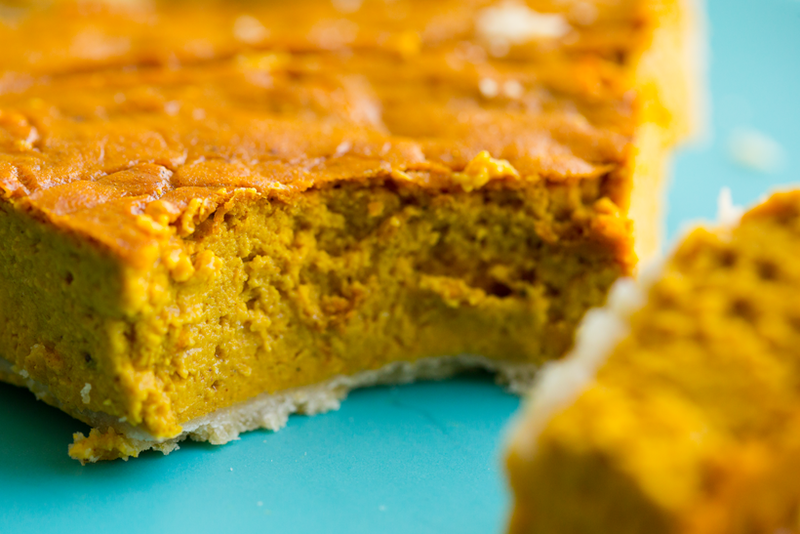 So if you only have pumpkin pie mix, cashews and non-dairy milk on hand you can make this modified pie! For Pumpkin Pie.. If you want to stay truly homemade, you can use your own real pumpkin puree. Otherwise, use canned 100% pumpkin and add your own sweetener, salt and spices. Or a Pumpkin pie mix includes spices and sweetener. Pie Mix? I was pleasantly surprised by the quality and flavor of the pumpkin pie mix. 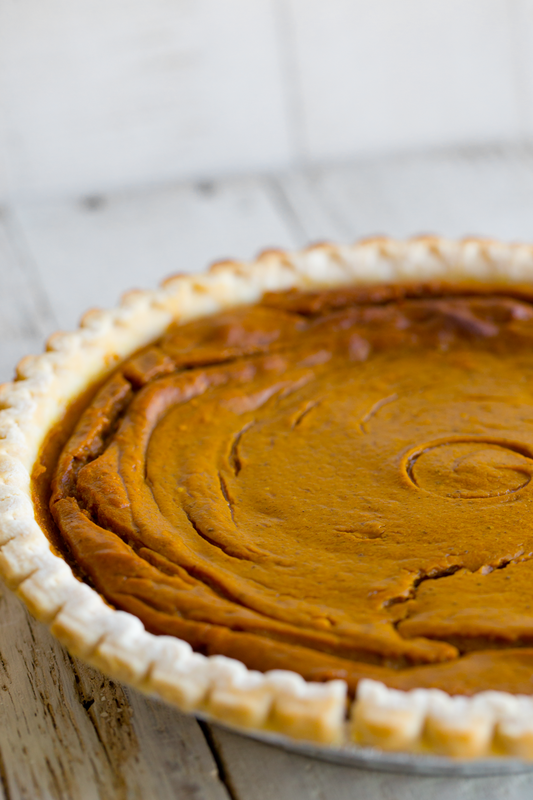 I think most of us baking a homemade pumpkin pie want to shy away from terms like "mix". And "pre-made". But really, don't put too much pressure on yourself to make this recipe harder than it has to be. I was quite pleased with the results of my pie - using the canned pumpkin pie mix. 28 ounces (3 1/2 cups) pure canned pumpkin (or equivalent fresh pumpkin puree) Pumpkin Puree Recipe I found here. 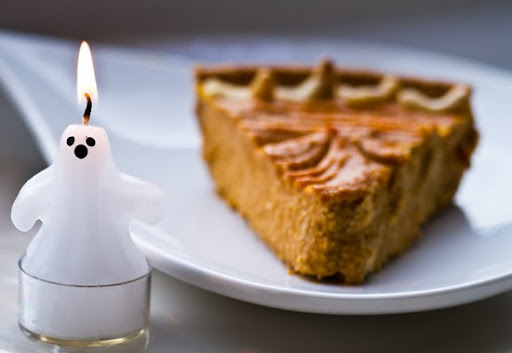 Perfect as a Spooky Halloween fall treat or serve at an upcoming holiday season feast..
1. 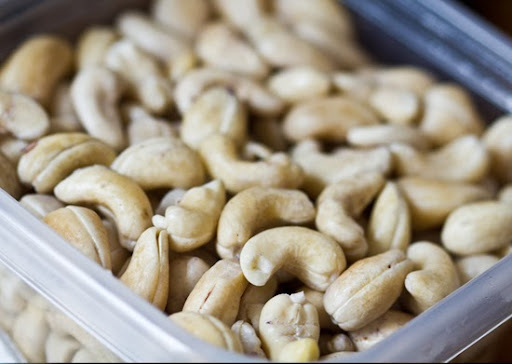 Soak your raw cashews in salted water overnight or at least 6 hours. They should break apart easily and be tender to bite when properly soaked. 3. Drain your nuts and set aside. Also set aside about 15-20 cashews or garnish. Gather all ingredients and set aside as well. 4. 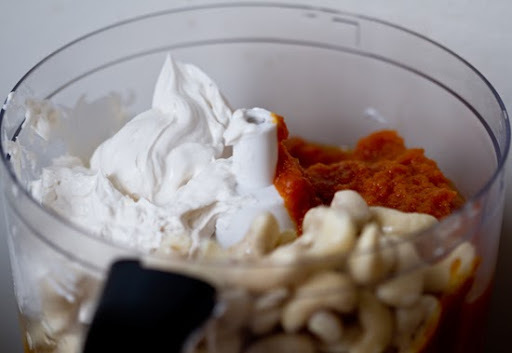 In a food processor, add the cream cheese, pumpkin pie mix (or substitute ingredients), cashews and lemon juice. 6. Pour your puree into your two pie crusts. 7. Swirl and smooth top with fork. Dot on cashews around the edge and center as you'd like. 8. Bake at 375 for 30 minutes. Cool. Place in fridge to firm before serving. Serving suggestion: Vegan whip or ice cream! I made this one back in 2010, without a Vitamix. The Vitamix or another high speed blender really makes for a smoother filling..
..but I do love the cashews on the edges of the pie! Forgot to do that for my video! That is a fun signature move. Happy pumpkin pie season everyone! Want more recipes? Hop over to Finding Vegan Meals!